will be participating in this year’s WA City of Water Day. 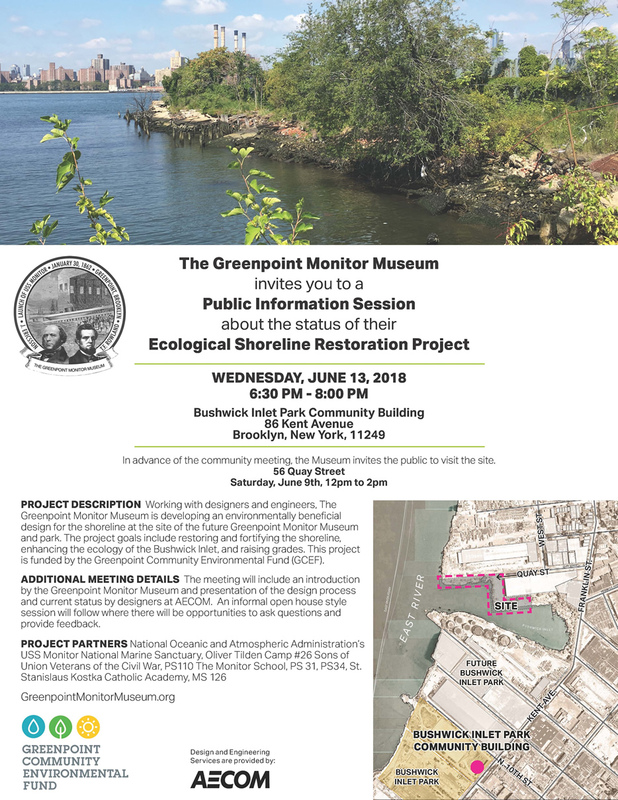 Learn about the Greenpoint Community Environmental Fund (GCEF) grant recently awarded to the Museum for the engineering design and permitting for a restored living shoreline. 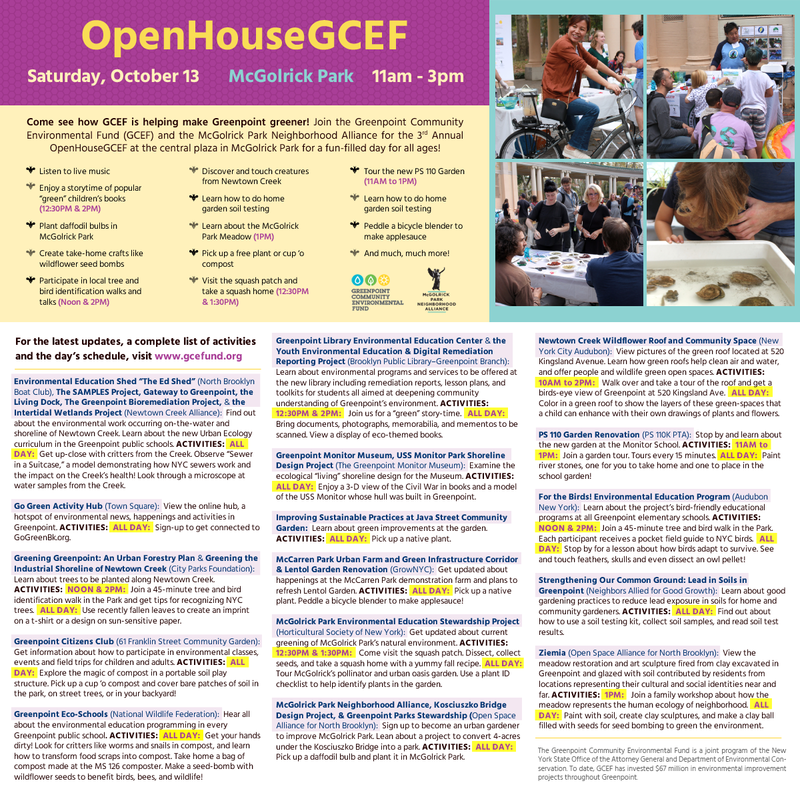 Please come out and join us at the museum's land on the Bushwick Inlet! Click below for more details on this free event! In advance of the community meeting, the Museum invites the public to visit the site. 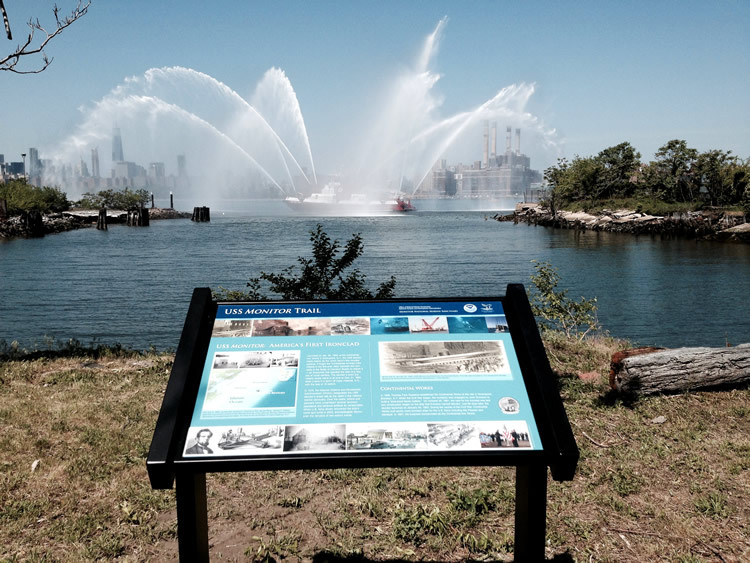 On May 29, 2015 the Greenpoint/Williamsburg/New York City Community were honored when David Alberg, Superintendent of the National Oceanic and Atmospheric Administration’s USS Monitor National Marine Sanctuary, unveiled a USS Monitor Trail Marker on the grounds of The Greenpoint Monitor Museum in an effort to keep alive the memory of the USS Monitor and her crew, John Ericsson her designer, Thomas Fitch Rowland her builder and his workers. Linking this land (which shares the launch site of the Civil War ironclad USS Monitor) to other USS Monitor historic sites including Hampton Roads where she fought against the CSS Virginia (ex USS Merrimac) on March 9, 1862 is NOAA’s goal. The impressive unveiling ceremony included a New York City Fireboat Water Cannon Display, patriotic songs by PS110 – the Monitor School chorus and a color guard including Oliver Tilden Camp No. 26 Sons of Union Veterans of the Civil War, Company I 83rd NY State Infantry Sons of Veterans Reserve, and Cadets from the Kingspoint United States Merchant Marine Academy. Community members together with their organizations were in attendance including students and teachers from PS110, PS31 and MS126 John Ericsson School, Deputy Boro President Diana Reyna, Assemblyman Joseph Lentol, City Councilman Steve Levin, Commissioner Loree Sutton of the New York City Department of Veterans’ Services, members of St. Stanislaus Memorial American Legion post #1771. 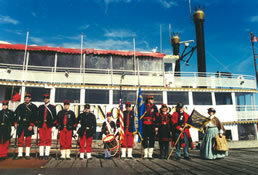 The Ceremony was followed by an all day History Fair at the nearby Brooklyn Expo Center including exhibitor displays and presentations by the Sons of Union Veterans of the Civil War, Metropolitan Waterfront Alliance, Fort Hamilton Harbor Defense Museum, St. Stanislaus Memorial American Legion Post #1771, Daughters of Union Veterans of the Civil War, Grant Monument Association, USS Lehigh, William Finlayson and Patrick Falci Civil War Roundtable, United States Merchant Marine Academy, Cathryn Newton discovered USS Monitor with Father on Duke University Research Vessel, NOAA’s USS Monitor National Marine Sanctuary, New York Aquarium, The Greenpoint Monitor Museum, NYC Fire Museum, Hilary Russell, Norman Brouwer, AECOM, Philip Koether Architect, United Metro Energy Corp, PS 110 The Monitor School, PS 31 Samuel F. Dupont School, MS126 Leo Club John Ericsson School. 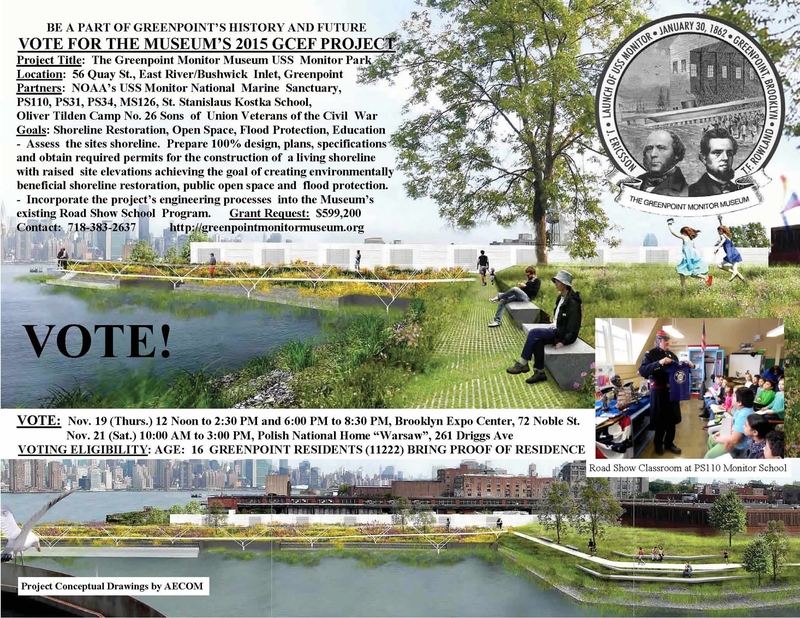 On September 15, 2016 the engineering firm AECOM commenced site investigations on the land as part of the Greenpoint Community Environmental Fund grant the Museum was awarded to restore the land’s shoreline, raise it to assist in flood control efforts and provide community access to the beautiful site. On this day, along with this exciting project start, came the discovery of the theft of the USS Monitor Trail Marker which was last seen about a week before. THROUGH THE 94TH PRECINCT AND ANY LEADS THAT MAY HELP. Museum site in Greenpoint, Brooklyn, NY. few blocks away at the Brooklyn Expo Center. Click below for a Preliminary Notice of the event. The end of the NY City threat of eminent domain on its historic land. to the Museum's USS Monitor Park on the Bushwick Inlet. 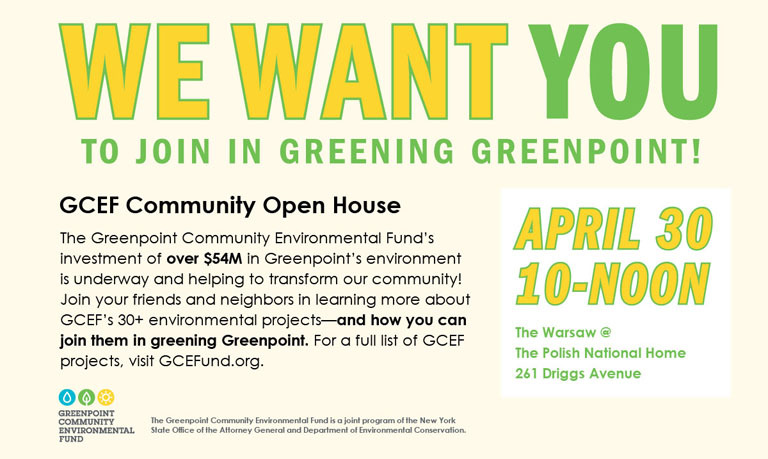 through the Greenpoint Community Environmental Fund. beneficial shoreline restoration, public open space and flood protection. on the Bushwick Inlet, Greenpoint, Brooklyn, New York. 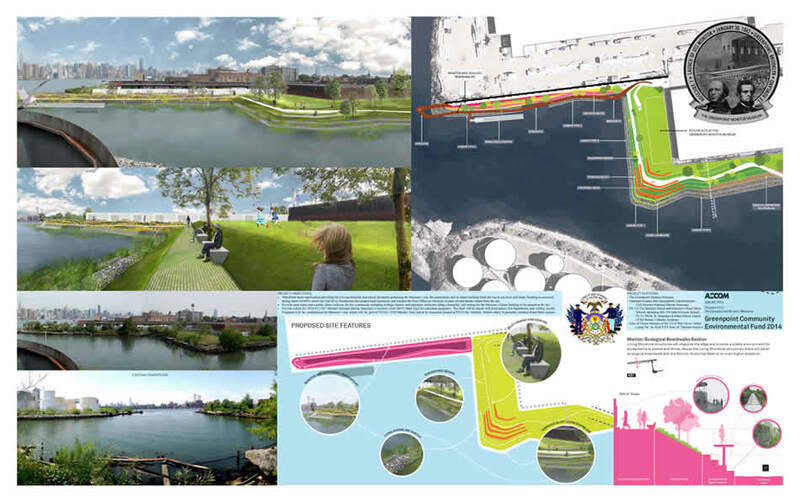 *FOR CLARIFICATION, THIS PROPOSAL IS NOT PART OF THE NEW YORK CITY PARKS DEPARTMENT PLAN FOR THE BUSHWICK INLET PARK. THE GREENPOINT MONITOR MUSEUM FOR ITS LAND. "BREAKING NEWS" LINKS ARE ACTIVE AT THIS TIME. Our project will prepare the Museum's waterfront land for public access and we will have educational programs with NOAA's Research Vessel docked at the site. A bulkhead for flood protection for the Greenpoint/Williamsburg comunities. Solar lighting is also included in the pre-proposal. 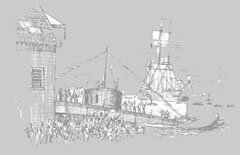 Greenpoint, Brooklyn, NY the birthplace of the USS Monitor! Tax Free donations are accepted. JOIN US ON THE "ROAD SHOW"
BY CLICKING ON A SCHOOL BELOW. P.S. 110 - THE MONITOR SCHOOL CLASS 2 Coming soon! P.S. 110 - THE MONITOR SCHOOL CLASS 3 Coming soon! ST. STANISLAUS KOSTKA CATHOLIC ACADEMY Coming soon! P.S. 161M - PEDRO ALBIZ COMPOS Coming soon! AWARD CEREMONY 2014 - 2015 Coming soon! AWARD CEREMONY 2013 - 2014 Coming soon! 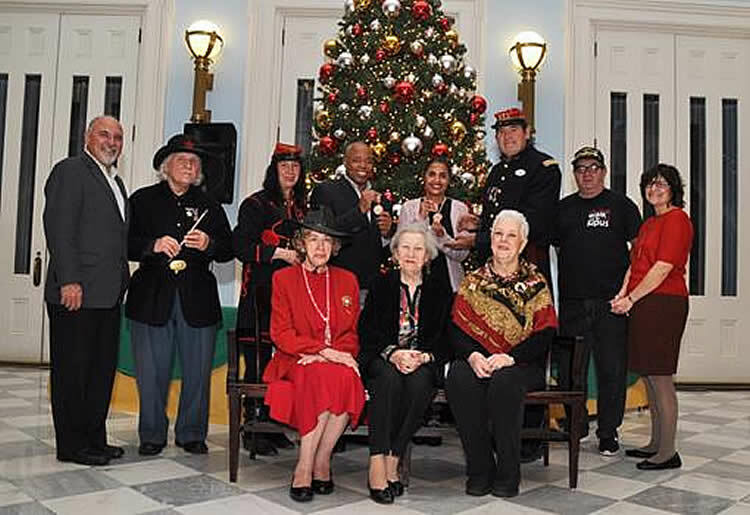 Civil War and Greenpoint history alive!